We got to Santiago on a Saturday and took it easy during the day in order to fully indulge in the city’s pulsating nightlife. Due to doing that quite thoroughly until the next morning, we kind of had to take it easy the next day too. After having sufficiently recovered, we started our sightseeing tour. 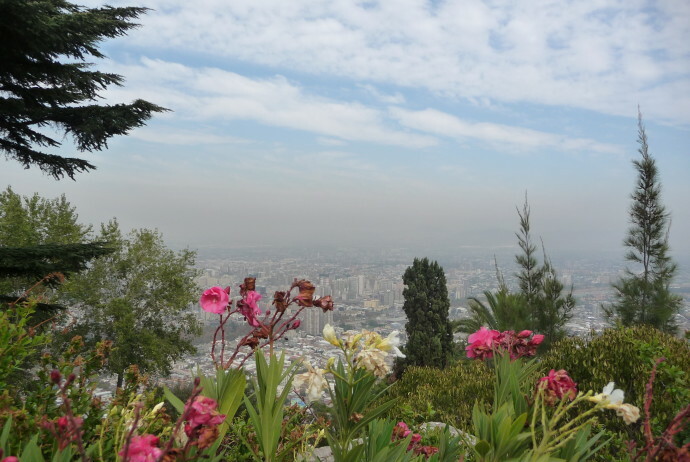 We, of course, hiked up the San Cristobal hill, Santiago’s major tourist attraction, had a lovely fish and seafood lunch at the Mercado Central, strolled along the shopping streets in the city center and spent lots of time laying around in the city’s many parks, usually while enjoying delicious ice cream. The ice cream was necessary, as despite it being fall, it was still really hot. We furthermore explored Santiago’s outskirts, by hiking in Parque Natural Aguas the Ramón and Parque Mahuida, from where we got impressive overviews of the sheer size of this huge city, of the not less impressive layer of smog covering it and also of the snow-covered peaks of the Andes surrounding it. Moreover, we had a great time exploring the city’s various “comunas” (that’s how the different neighborhoods are called here), of which many have squares full of constantly crowded bars and restaurants. After 5 days in this beautiful and slightly European-vibed city, we were relaxed, happy and ready for new adventures in Bolivia. Where to sleep: The Princesa Insolente Hostel – quiet, welcoming and clean! Where to eat & drink: Mares de Chile – delicious fish and seafood and super friendly servers in the Mercado Central. Plaza Nuñoa – a favorite after work spot for locals with lots of bars and restaurants. What to do: Nightlife in Bellavista – the #1 party area. Parque Natural Aguas the Ramón – scenic hike to a beautiful waterfall.